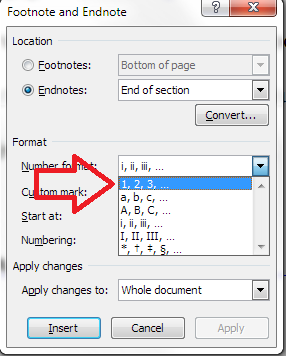 How do I change the numbering style of footnotes and endnotes in Word? As part of my series on footnotes and endnotes, here’s how to change your footnote and endnote numbering styles on the go (e.g. while editing someone’s work, or when you change your mind, or when you’re working to a particular journal’s style and need to amend something you’ve already written) in Word 2007, Word 2010 and Word 2013. 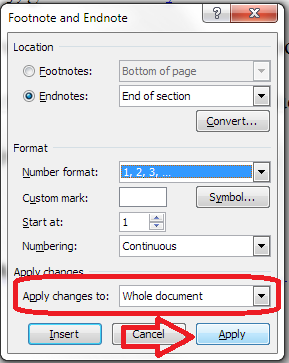 Why would I want to change my footnote or endnote numbering style? The main reason to change your footnote or endnote numbering style is because of the style guide of whatever you’re writing the document for. For example, academic journals will usually have some form of Guidelines for Authors which will lay out (sometimes) the font, heading styles, reference styles and footnote styles that you are expected to use. If you’re re-using an article which has been rejected by another journal, or repurposing a chapter of your PhD, you might find that the style for one journal is different from what you’ve done previously. Alternatively, you may just decide you would prefer to use roman numerals, arabic numerals, symbols or whatever for your footnotes or endnotes, and want to change them. We can see lots of things we can do here, including changing the number footnotes start at, whether they restart every chapter, etc. (these more obscure details will be the subject of another article). But for our purposes, the important features are choosing whether you’re telling Word about Endnotes or Footnotes and telling Word what the number format should be. In this case, we’re using Endnotes (although these instructions cover both), so I’ve clicked the radio button (circle) next to Endnotes. This tells Word that we’re using Endnotes and talking about the Endnote numbering. When we return to our document, the endnote numbering has changed from a roman numeral (i) to an arabic numeral (1). You can change this as many times as you want. 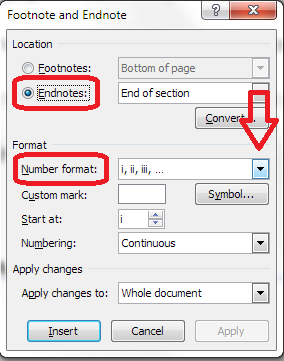 This article has explained how to change the number format in your footnotes or endnotes. I’m approving this question but can’t answer it myself, I’m afraid – you’ve obviously got the Arabic script enabled and the language enabled in Word, so I’m not sure why you can’t get your format of choice. I hope another reader will be able to answer this! I want to change the footnote ‘break line’ form right justified to left justified and cannot find any way to do this. Any ideas? Change to DRAFT view. Go to References. Select Show Notes. The footnotes dialogue box should come up. Choose View Footnote Area. Choose Footnote Separator. Use normal formatting in Word to amend it. Close. Note: I haven’t tested this yet, so let me know if this works! I would like to know how to set the document so that there are two sets of footnotes on the same page. For example, I would like to have one that uses the Roman numerals (i, ii, iii…) and one that uses Arabic numerals (1, 2, 3…). Do you have anything that gives guidance on doing so? Thanks! Thank you for your question. Unfortunately, Word won’t allow you to do this. It’s also not common practice – it is fairly common to use footnotes with symbols that appear at the bottom of the page and then references using numbers which appear as endnotes, and you do that by inserting a footnote or endnote respectively as you go along. I’m not sure why you would want both types of numbering in the footnotes. If you can give more detail on that, I may be able to advise further. The journal I am writing for requires endnotes in  format, i.e. numerals in  and not superscripted. It is possible to do as I have seen it in templates, but can’t figure out how to set it myself. Any ideas? Thanks for your question, Scott. You can change the style of your footnotes by using the arrow at the bottom left of the Styles section in the Home tab, chosing modify at the bottom left, then alphabetical to get the list, then find Endnote Reference and you can remove the superscript. However, I’m not sure how you get it into the square brackets, I’m afraid. When I’ve used this system, the numbers are sequential but appear more than once , like I’ve done here [1,2], so it’s then not a linked reference list like in a true endnote  but a list of references that are numbered  and then referenced in the text. Please let me know if you find out how to do the square brackets though. I did find this https://word.tips.net/T009253_Brackets_around_Footnote_References.html if that helps, but it seems weirdly complex! this didn’t work for me. i hit “apply” and nothing changes. Thank you for your comment. Did you follow all the steps in the article? Which version of Word are you using, and for PC or Mac? For versions where there is no “Reference tab that has a footnotes tab” —-> you go to delete the superscripted endnote and a message pops up warning you that you’ll lose the citations AND includes “options” to change the format. This is where I clicked on options and followed the above instructions. That’s interesting, thank you. Which version of Word are you using? I have a word document which was assembled from different other and older versions. In all the pieces were endnotes, sometimes with numbers, sometimes with other symbols like * or **. In the final document all the notes were together in the order of the different parts. But how can I finally renumber all the notes with different symbols to one continuous series of notes? Do I need to do that all manually or is there a trick to do this job automatically? Thank you for your question. 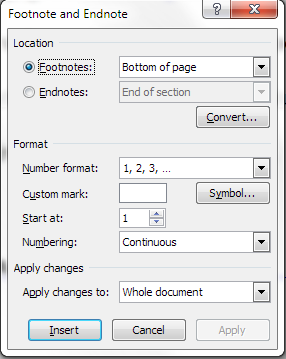 Have you tried going into the format footnotes dialogue boxes and changing the numbering? You might need to highlight the whole document first and I’d do it in a copy of the document, just to be on the safe side. Let me know if that works. Interesting question. I’m not sure you can do that – but if you can, it will involved inserting a section break between the parts of the text with the two different kinds of footnote. Let me know if that works! I am trying to prepare a scientific paper for publication and I need to switch endnote numbering from lower case Roman to Arabic numerals. [Mac] The problem is – there is NO ‘Reference’ tab!! The tabs are: Home, Layout, Document Elements, Tables, Charts, SmartArt, and Review. The menus at the top of the screen are File, Edit, View, Insert, Format, Font, Tools, Table, Window, a script icon, and Help. I looked under all these [except Help, which I know from experience is nearly useless] and found no tool for this problem. This version of Word, according to the ‘About Word’ menu item, is version 14.1.0 of Microsoft Word for Mac 2011. I remember switching endnote numbering some years ago when I wrote my Ph.D. dissertation, and I remember this tiny change coming only at the cost of a very long struggle, which I will have to repeat unless you can cut thru the jungle. Thanks. Thank you for your question, Mark. Unfortunately, as I say at the top and bottom of the post, my articles are about Word for PC (I’m not a Mac user) and although similar options should be available for Mac, I can’t guarantee that, not am I able to check easily. However, my lovely commenters often solve each other’s problems, so I will leave this comment up to see if anyone can help you. Good luck! How do I change the style for the the endnote number in the Endnote list to be normal non-superscript font but keep the in-text endnote number superscript? Thank you very much for this information.It helped me a lot. Hi, my document multiplied the Endnote number went from 29 to 491, how can change it is a book manuscript with original footnotes. Hm, an interesting one. I’d suggest saving the text of the footnote then removing the footnote where the numbering jumps and seeing what happens, then reinserting it. That’s what I’d do. Let me know if that works. Re: Veronika Ambros. Another possibility is that the document has tracked changes, which can throw off endnote numbering. If the document has tracked changes, Save As to create a test version, accept all changes, update all fields (select all, then F9), and see if the endnote numbering is fixed. Ah yes, good idea, thank you for contributing!